What shall a man say when a friend has vanished behind the doors of Death? A mere tangle of barren words, only words. I recently read some perceptive comments on the TTA Press Discussion Forum about two of the Big Names in the Weird Fiction field, S. T. Joshi and Don Herron. The posts were intriguing because they did not come from the usual crowd. These are not fans plugged into the main Howard scene, and hence are people who are judging the merits and demerits of Joshi and Herron objectively. There should be an emoticon for the pensive but resigned frown… I’m continuing this topic from the Nemonymous board to canvass thoughts on this extraordinary critic and archivist–a man whose sharp insights and sarcastic barbs are as impressive as his blind spots and biases are frustrating. The Lovecraft biography is a serious classic. Joshi’s recent book The Modern Weird Tale is a mixed bag, highly idiosyncratic and unfair, but full of good insights. His new book The Evolution of the Weird Tale, despite its grand title, is basically a collection of review articles; but it’s enormous fun and less narrow than some earlier Joshi stuff. The Weird Tale, published in 1990 and covering the weird fiction genre from Machen to Lovecraft, is ambitious and dynamic but heavy-handed and too fond of extreme statements. Behind the veils of academic objectivity, Joshi can be seen to be a volatile, short-tempered, aggressive and highly intense young man. He has mellowed a little since, though his sarcasm can still wither at forty paces. Howard fans can only laugh–that’s almost exactly the rep Joshi has acquired in our neck of the woods. Some “good,” “ambitious,” and “dynamic” insights, marred far too often by “highly idiosyncratic,” “unfair,” “heavy-handed,” “extreme,” “volatile,” and “short-tempered” critical judgments. And the latest news is that the two volumes of revised, annotated Lovecraft stories edited by S.T. Joshi for Penguin Modern Classics is to be followed by a third containing… everything else! ‘The Dreams in the Witch-House’ will be out in the UK next year and will complete the set of revised Lovecraft texts in mass market paperback. I’m not sure whether to be impressed by this purposeful rebranding of Lovecraft’s work or disappointed that the opportunity to consign the dozen or so weakest stories to the dustbin of history was missed. Well, there’s the ‘Penguin Encyclopedia of Horror and the Supernatural’, about 20 years old now. And the St James Encyclopedia of Horror, Ghost and Gothic Fiction, a massive and costly volume which I don’t own–I wrote six entries, but didn’t qualify for a comp. copy. There’s some very good stuff on the horror genre in Ramsey Campbell, Probably, as well as much else of interest (and the occasional foray into the realm of Too Much Information). And Don Herron’s excellent anthology of essays on Robert E. Howard, The Dark Barbarian, has recently been reissued by Wildside Press. Can anyone recommend other studies of the field? Don Herron’s take on King is, in my view, the definitive assessment: he claims King writes the kind of fiction you’d expect from a professor (loaded with theme and symbols, ripe for critical dissemination), rather than a raw artist. However, he also claims that King, at his best, could produce great stuff (not Shakespeare, but great all the same): “Apt Pupil,” The Shining, “The Woman in the Room,” etc. Nevertheless, he also claims that King can’t control the quality, that he only ever hits to high notes occasionally. Sums the guy up nicely, methinks. Gary, I’ve not read a lot of King but that does sound a more balanced assessment than a lot of people offer on him. Way more charitable than Joshi’s take on King, for example. There you have it, guys outside of Howard fandom simmering with many of the same evaluations of Joshi and Herron that we have historically had. Joshi is blissfully unaware of how many intelligent fans his criticism has offended on an aesthetic level over the years, how plain wrong many of his opinions are, by any standards. I wonder if he’ll ever figure it out. Yes, I think King’s vast popularity has blinded some critics to the power of his best work. The Dark Half in particular is brilliant. He’s not terribly original, but he is passionate and intense–features that most commercial horror fiction notably lacks. Joshi’s grandstanding denunciation of King is the most disappointing feature of his criticism, though he does offer a fair-minded critique of Straub. “Disappointing” is one of the words I hear most associated with Joshi’s critical work. Oh well, bad criticism fades away when the living critic does, while good research–Joshi’s strength–endures. My guess is that books like The Weird Tale, The Modern Weird Tale, and The Evolution of the Weird Tale will fade into merciful oblivion in due course, while the various indexes, pure texts, and biographical finds will become standards. Meanwhile, Herron’s critical books on Howard, as far as I can tell, are here to stay. For each essay contained within, one finds it very difficult to think of another essay anywhere that has covered the same subjects better. The copies of The All-Around Magazine went for $911.01, and the winning bidder was "acidgothic." Considering that original Howard letters have gone for about that in the past, it’s a sign that REH collecting is really heating up. With the centennial looming, that’s great news. Girasol Collectibles, the outfit who has made a name for themselves by selling facsimiles of golden age pulps (and who released the REH book of public domain stories Blood of the Gods and Other Stories in Canada) has announced they will be releasing facsimile copies of all of the REH Weird Tales stories in several hardcovers, to be released late this year or early next year. Finally, REH fans will have a way to buy all of these “tear sheets” in one fell swoop, without having to collect thousands of dollars of rotting pulps. Hopefully they will also collect all of the REH-related letters in The Eyrie, but that is likely too much to ask. The eBay auction for the original copies of "The All-Around Magazine" from the files of Tevis Clyde Smith is heating up, with the price at a healthy $660 with a day and a half left in the bidding. Yet another sign of how collectible REH has become. Tune in to eBay around 6pm Pacific Time on Wednesday to see the final brutal bids duke it out. 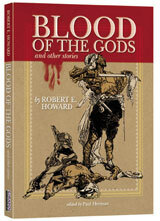 THE POETRY of Texan author Robert E. Howard is known to inherit a sense of barbarism, pure machismo and masculinity, in which the dominating male performs all the desired and necessary roles one is meant to embark upon. However, his work, much like the author, could not always uphold this performance, and shades of constraint and sensitivity became more apparent over the course of his life. Students of gender theory comment that masculinity has evolved into something much different than its literary predecessor; a change brought on upon the gender movements in the latter twentieth century. No longer is it a case of being a gentleman or a brute; it is now a matter of performing the ‘ideal’ subject position. Normative masculinity seeks to merge the two opposing forces together. In the following article, Howard’s “The Gold and the Grey” (a.k.a. “An Echo From the Iron Harp”, will be used to discuss the double-bind inherent in normative masculinity, operating both aggressively as power and repressively as constraint. Great, great stuff for those of you who can’t get enough of Ben Zoom. Perhaps the best thing about the journal is that it is written using the risible quasi-academic MLA style that is the vogue in weird fiction studies, proving yet again that being MLA approved or having an article with footnotes means absolutely nothing in the real world. Without good writing and half a brain, all the citations and certifications in the world can’t help you. It’s time that fans of REH, CAS, and HPL leave all of that nonsense to real academics and concentrate instead on writing well and accurately for intelligent, general readers. You can download the whole PDF here. 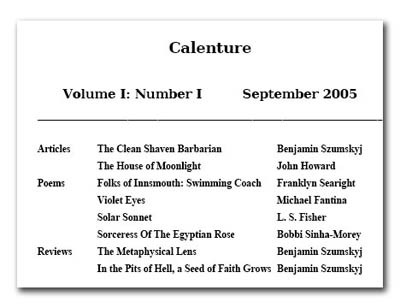 Currently Calenture is soliciting papers for a special Clark Ashton Smith issue. One can only hope that Fate takes pity on poor CAS and renders the journal defunct before that can ever appear. Here is an original copy of an extremely rare item, the All-Around Magazine, printed by Tevis Clyde Smith on a hand printer given to him by his parents. (Little handmade "boys’ magazines" were popular at the time. We have an extensive collection.) The whole run of "Volume 1"–which includes number 1, number 2, the combined number 3 and 4, and number 5–is included in the sale. (That’s four issues in all.) I believe this one "volume" is the whole extent of the All-Around that was ever produced. 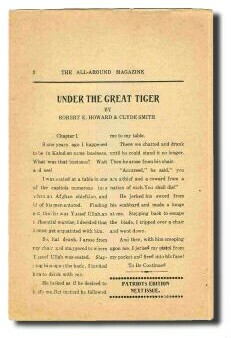 In the combined number 3 and 4 is the beginning of "Under the Great Tiger," cowritten by Smith and Howard; the story is finished in number 5. This item comes from the estate of T. C. Smith; except for two copies that the estate has sold to private collectors, the All-Around exists nowhere else (to the best of my knowledge). The cheap paper is naturally yellowed and brittle, and a bit frayed on some edges, but untorn. A fragile bit of rare ephemera, and an indispensable addition to the serious Howard-Smith collection. This is basically a one-of-a-kind item, it is doubtful any more copies of this mag still exist. It will be interesting to see how much money it ends up going for. The seller has many more items relating to Tevis Clyde Smith at his eBay store.